First day of the festival and I drew peg 5 on Bennys Lake, which turned out to be a busy day! I caught f1’s shallow from the off on 4mm pellets, catching ‘one a bung’ all day. I finished the match with 299lb and more importantly, a section win! And to top it off, it was a new personal-best match weight. I was on Beeches lake the following day I hopefully I could snare a few of the ‘big boys’. Come Day two and I’ve drawn peg seven, on Beeches, where I enjoyed a steady start, fishing short, feeding 6mm pellets before moving onto the bomb later. I had a few fish on this, before switching again to finish the match fishing groundbait and corn down the edge. The mix being a 50:50 combination of Dynamite Swim Stim Green and Marine Halibut. I did struggle at times to put a run of fish together, which I feel cost me, but also the bright sun didn’t help either. I weighed 155lb for second in the section and third on the lake, but well done to Rice for winning the section with 189lb! For the third day, I drew peg 14 – Willows. Starting on short pole with 4mm pellets I quickly had three f1’s. Swapping over to the 13m line, which I planned to fish shallow, I managed to land eight fish ‘on the bounce’, before this line went really ‘funny’. To combat the fish’s finicky nature, I’ve tried throwing a Method feeder over this line and then up the bank to my right. I finished with 117lb. This was enough for 2nd in the section and 3rd on lake. So still in the hunt going into day 4. I really don’t think I could have won the section as I feel I’ve been lucky with a couple of fish up to 10lb and three over 5lb. Day 4 of the festival and I drew peg 6 on Bonsai. I fished a tidy simple match shallow across in the reeds with casters all day. This saw me finish the match with 217lb, which again earned me a second in the section and second on the lake. Last day of the festival and I drew peg 48 on Loco. It had not been great all week, so I wasn’t overly impressed with the draw. I started on the Method and had three f1’s, before I’ve thrown a little further and nicked a few more. 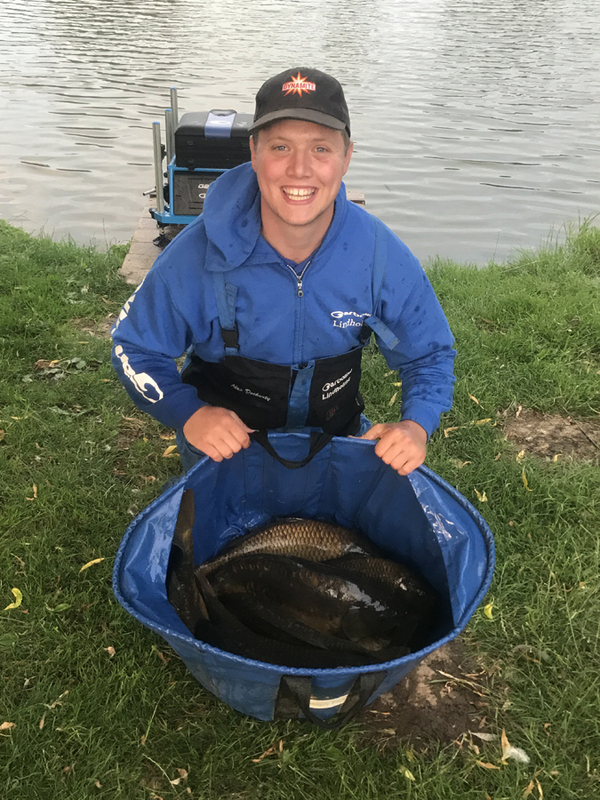 I then fished casters shallow at 14.5m for the rest of the match, enabling me to put 116lb on the scales, which has given me that all important section win. When the final results were calculated, I had six points, dropping two and a total weight of 908lb. This was enough to put me in third place…happy days! I’d like to say a big well done to Paul Holland and Dale Shepard for coming first and second respectively. 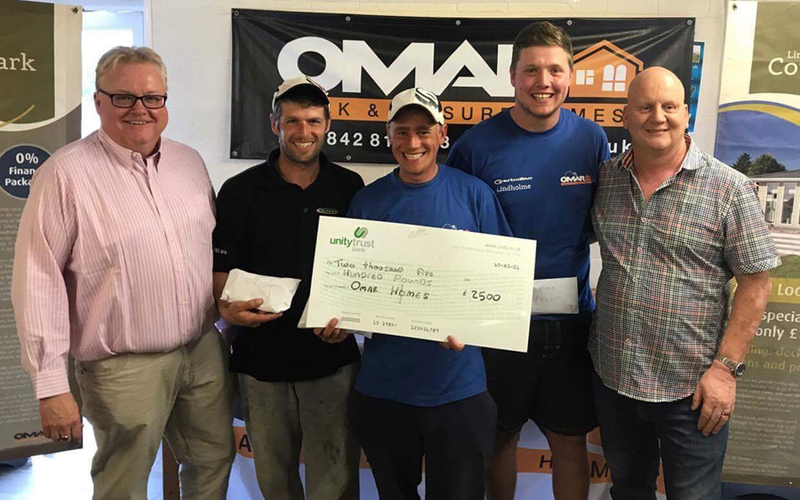 Lastly, I would like to say a big thank you to Neil and Aaron Grantham and Dean at Omar Homes for sponsoring and putting the work in to make the festival such a fantastic week.